For a huge nerd like me, fantasy football is a major disappointment. Don’t get me wrong, I absolutely respect the genius of the game, but I also can’t help but feel like using the term “fantasy” and then not stuffing your game full of orcs and elves and goblins is a huge disservice to just about every human being on the planet. Fortunately, I am not alone in this because Games Workshop, creators of the Warhammer franchise, apparently feel the same way too and have been making strides to rectify this grievous oversight since 1986. Blood Bowl is the result of that crusade, a deliciously violent turn-based strategy game that tosses out majestic castles and spellbinding woods in favor of settling its conflicts on the football pitch. Blood Bowl 2, developed by Cyanide Studios, is the digital translation of the long-running Blood Bowl tabletop game brought to PC, PS4, and Xbox One. Like any other football game, you’ll pick from a set of teams and manage them both on and off the field in a gruelling competition to determine who is the best. 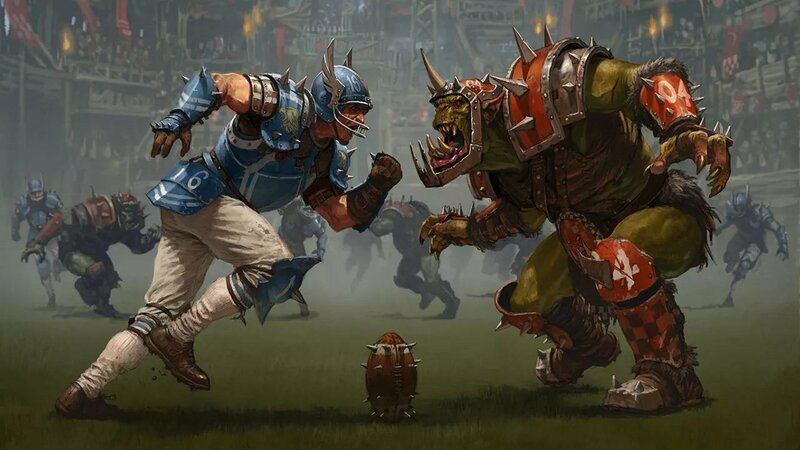 Unlike other football games, Blood Bowl is a vicious competition where goblins square off against dark elves, where referees can be paid to look the other way, and where the fans will tear to shreds anyone clumsy enough to step out of bounds. It is ridiculous and charming, but like its physical forefather, it’s also deep. If you’re a newcomer to the sport of Blood Bowl like me, it’ll likely take more than a few hours before you feel comfortable holding the coach’s clipboard. There is a mechanical depth to Blood Bowl 2 that just cannot be understood without investing the time in playing the game, and even then, it’ll likely be awhile before you start to grasp the nuances of Blood Bowl 2 well enough to start pulling off some truly ace plays. Fortunately, Blood Bowl 2 comes packed with a story mode that, along the way, will gradually introduce you to new aspects of the game in a manner that lets you focus on them piece-by-piece. For starting out, it proved a very effective method for guiding me through how to play, but it also didn’t take long before I tired of it altogether and focused more on playing in league matches and learning the rest for myself. For one, while I applaud the effort to try and cultivate some element of story surrounding the game, chiefly told through the banter between Blood Bowl 2′s sports commentators Jim Johnson and Bob Bifford, their constant interjections and the cutscenes that often bookended a match grew tiresome. They simply weren’t that charismatic, and the game’s attempt to replicate the presentation of sports programming felt ham-fisted. Fortunately, so little of Blood Bowl actually hinges on these two characters that once you complete the main story, you’ll likely forget they exist. The actual sport of playing Blood Bowl 2, however, is anything but forgettable. While the game only offers a small sliver of the total roster of teams available in the table top game (with more likely to appear over time as paid downloadable content), the eight teams I could choose from each felt so diverse and unique from one another that I didn’t really feel like anything was missing. Each team has a strategy that befits their racial stereotypes beautifully. While humans act like jack-of-all-trades, others, like the dwarves—who specialize in defence and fighting but aren’t so great at actually moving the ball—provide viable alternatives. After seeing how cruel they could be in the story mode, I found myself falling love with the dark elves, who weren’t all that sturdy, but were capable of making some truly devious plays. The act of playing Blood Bowl 2 doesn’t actually feel like football at all. Sure, you might pass the ball, run defence, or kick it to the enemy team after a touchdown, but the turn-based strategy really offsets the fluid intensity of a play. However, the depth of Blood Bowl 2, and the skill to counter your opponent’s play with your own can lead to truly satisfying moments. 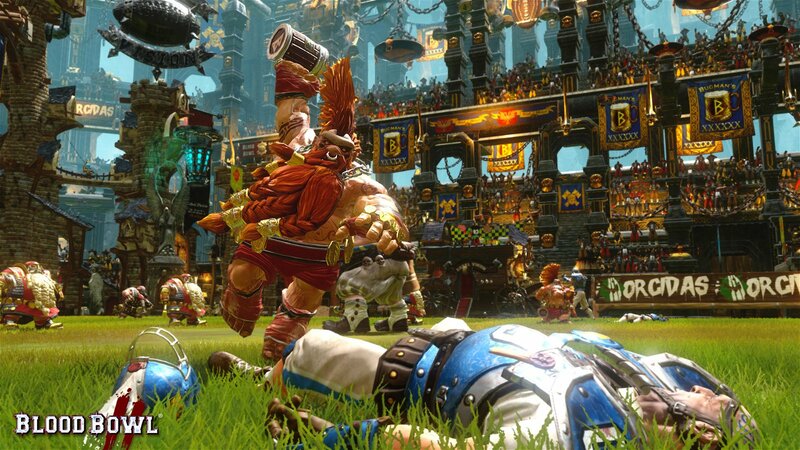 It might be slow-paced but Blood Bowl 2 can be every bit as intense. Because every move in the game is governed by rolls of the dice, there is always an element of random chance that can see the most surefire plan backfire, and the most improbable Hail Mary succeed. But things aren’t all sunshine and rainbows on the blood-soaked field. Though Blood Bowl 2 offers a sturdy suite of online options to facilitate multiplayer leagues, I found the lack of a lobby system a bit odd. Without the ability to chat with friends outside of the game, organizing matches has to be outsourced to another chat client, which doesn’t make a whole lot of sense. Furthermore, though Blood Bowl 2 looks great, it’s also sorely lacking in graphical and sound options. Narrators cannot be turned off and graphics can’t be tweaked—something I found very disappointing on the PC. Character customization is also something that, given Warhammer’s history in that department, I found lacking. There is very little to distinguish your key players from one another, something I think will prove a big barrier for those wanting a more engaging, personalized experience. Blood Bowl 2 is rowdy and raucous and there needs to be more of that in our games. It captures the spirit of Warhammer’s lighter side and translates it beautifully onto the screen. I just wish there were more options to tailor that experience to my tastes. That said, I’m happy that I can finally join the water cooler chats about fantasy football picks. I guess I’ll just need to endure the stares when I dive in with an anecdote about how Grommash Hellsburger killed the other team’s minotaur during the last match. 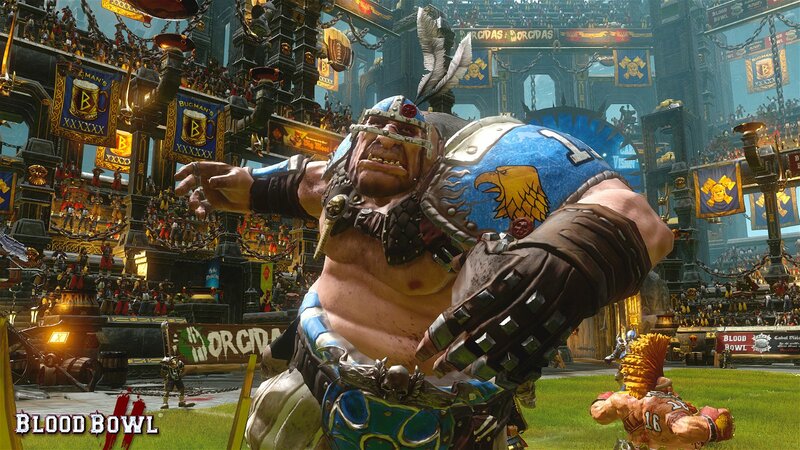 Blood Bowl 2, developed by Cyanide Studios, is the digital translation of the long-running Blood Bowl tabletop game brought to PC, PS4, and Xbox One.